Is Everything Better in Boulder? Roaming around Boulder, Colorado, is like stepping into Richard Scarry’s busy, busy outdoor town. Everywhere you turn people are doing sporty things. I didn’t realize how busy Boulder was until I visited on a recent Sunday. The town buzzed under a benevolent autumn sun. In the creek next to the public library, a fly fisherman toyed with a brown trout holding in an eddy. Lycra-clad cyclists whizzed by in pairs and trios. Sharing the same path were runners by the dozen. On a nearby lawn, two women moved through Planks and Cobras on orange mats. On Broadway I passed more cyclists and a guy roller-skiing. Colorado Avenue was closed for a bicycle race, so I swung northeast to 47th Street and watched a bearded hipster tow a wooden canoe with his mountain bike. Up Boulder Canyon Drive, young climbers clipped chocks to their racks before red-pointing a sun-warmed route. Everywhere I went, grown men and women paraded about in bike shorts, technical jackets, and yoga pants. The dudes could have stepped out of a Patagonia catalog. The dames looked like models for Title Nine. As the afternoon waned, I parked and walked across the Chautauqua Lawn, a grassy approach to the dramatic stone slabs of the Flatirons, where the Rocky Mountains end like cleaved bones on a butcher’s block. Surrounded by dozens of hikers, I stopped to catch my breath and take in the view. Behind me the Rockies took their final bow. At my feet the Great Plains swept east. And between them sat Boulder, the healthiest town in America. The data doesn’t lie. In the annual Gallup-Healthways Well-Being Index, which measures the nation’s physical and mental fitness, Boulder claimed the title of America’s healthiest community in two of the index’s first five years. In 2015, Gallup-Healthways changed its criteria to include only the nation’s 100 largest cities. Boulder, population 105,000, didn’t make the cut, so the official winner was Sarasota, Florida, which has an obesity rate of 21.4 percent. Boulder was like, “City, please.” Twenty-one percent? Boulder’s obesity rate is 12.4. It would be easy to dismiss Boulder’s low body mass index as a product of its college population, but the townies here are arguably fitter than the gownies. And its residents’ healthiness is just one way that Boulder stands apart. A 2013 study found that it had more startups per capita than any other U.S. metro area — which helps explain why unemployment here is a scant 2.6 percent, just more than half the national average. That outlier status didn’t happen overnight; it emerged from a rich mix of subcultures. Sure, altitude mattered. So did the beautiful natural setting. Money helped. More important, though, was the town’s embrace of new ideas and oddball lifestyles. The question now is whether Boulder can maintain that open-minded attitude. Health and fitness were a by-product of Boulder’s culture, but now they’re becoming one of its main draws — and the town’s historic acceptance of the different and the strange may be running into uncomfortable limits. The first thing you learn about Boulderites is that many of them started out somewhere else. “People typically have success elsewhere and then decide Boulder is where they want to live,” said Seth Levine, managing director at Foundry Group, a venture capital firm that’s the Kleiner Perkins of Boulder’s booming tech community. After making his finance bones in New York in the 1990s, Levine considered a lucrative job in Asia. “I realized that wasn’t the life I wanted,” he told me. “I was looking for more balance.” Balance, in this case, meaning more time to climb rocks and play Ultimate Frisbee. Boulder’s lifestyle remains a powerful recruiting draw, but now the investment, marketing, and tech talent have reached critical mass. Google will soon expand into a campus for some 1,500 workers at 30th and Pearl. In 2006, advertising guru Alex Bogusky moved Crispin Porter & Bogusky, the hottest shop in the business, to Boulder. Venture capital and tech firms cluster along Walnut Street near the bike shops and Nepalese restaurant. “This used to be a Subaru town,” an old friend told me. “Now it’s an Audi town.” And it’s becoming a Tesla town, the Palo Alto of the Rockies. In Boulder, outdoor activities aren’t merely hobbies. They’re self-defining. It’s an alluring mind-set. I once embraced it myself. Ten years ago I moved my family to Boulder for an academic-year fellowship at the University of Colorado. We loved the life so much we didn’t want to leave. We’d never been healthier. Our kids played outside. My wife hiked every day and took up telemarking. I snuck out to ski before work. We rented a house built like a national park lodge. Foxes, elk, and wild turkeys wandered through our yard. The sun never seemed to stop shining. Boulder changes people. Noncommittal joggers move to Boulder and become marathoners. Weekend cyclists become triathletes. Although my own family ultimately left Boulder after two years — drawn back to Seattle by family and lifelong friends — I know plenty of people who can’t quit the place. “If you could live anywhere, why wouldn’t you live here?” said Hillary Rosner, a Boulder-based science writer. A couple of years ago, Rosner landed a teaching gig at Syracuse University, in New York. She loved the college. The town? Not so much. “The weather’s terrible and everyone seemed unhappy,” she said. “Other than that, Syracuse was great.” After a single semester, a change in her husband’s job prompted an about-face to Boulder. It’s like the fisherman’s bumper sticker: The worst day freelancing in Boulder is better than tenure in Syracuse. How does a nirvana like Boulder happen? In this case, you can credit four waves of migrants: the eggheads, the climbers, the hippies, and the runners. When Colorado doled out the spoils of statehood, Denver got the capitol, Cañon City was given the prison, and Boulder landed the state university, which nurtured a local society that valued freethinkers and new ideas. After early tech businesses like Ball Aerospace and StorageTek set up shop in the area, UC provided a rich, scientific talent pool. Rock climbers, drawn by world-class routes in Eldorado Canyon, started arriving in the 1950s. While the dirtbag lifestyle was being forged in Yosemite — make a little scratch in winter and live frugally to climb all summer — Colorado legend Layton Kor established the practice in Boulder. The hippies followed in the summer of 1968. They spent a couple of months smoking grass on Chautauqua Lawn and decided to stay. From that gathering emerged the cornerstone figure, Mo Siegel. In 1969, Siegel and some friends harvested herbs in the hills above Boulder and sold them to co-ops in the town’s burgeoning natural-foods scene. In the 1970s, he turned that idea into a company called Celestial Seasonings and made a fortune selling herbal teas to America. That attracted other entrepreneurial hippies, like Steve Demos, who started the WhiteWave tofu company here on a $500 loan. Today the $3.6 billion business includes Horizon Organic and Silk soy milk. Then came the runners or, rather, the runner: the godfather of Boulder’s modern fitness culture, Frank Shorter. In 1970, Shorter was a skinny Yale grad who moved to Boulder, elevation 5,400 feet, to test his crazy ideas about training at altitude. Two years later his victory in the 1972 Olympic marathon inspired a wave of runners to move to Boulder. The road cyclists arrived soon after. In 1975, Siegel helped launch the Red Zinger Classic, a bike race named for his bestselling blend, as a way to promote bicycle transportation. Top prize money drew top riders. They came, they raced, they dug the Boulder scene — and they stayed. The runners and cyclists picked up on the philosophy that the climbers and hippies had laid down in the Sixties: Living for your passion wasn’t just OK, it was the right and natural thing to do. They put down roots and built a supportive infrastructure that continued to lure athletes to the town. Shorter brought a generation of runners here. After the Red Zinger years, Olympic medalists Connie Carpenter and Davis Phinney lured other top cyclists. Scott Jurek, the ultramarathoner who recently broke the Appalachian Trail speed record, moved to Boulder in 2010, lured by his friend Anton (Tony) Krupicka, two-time winner of the Leadville Trail 100. “The climbers, the runners, the triathletes, and the world-class yogis — that energy and motivation really draws across the lines of different sports,” Jurek told me. In fact, fitness is culturally valued in Boulder in much the same way wealth is esteemed in New York and political power is revered in Washington, D.C. In Boulder, fitness has become the common currency of success. Researchers have found that two factors play key roles in a person’s level of physical activity: modeling and social support. Modeling is simple. People learn behavioral norms by observing those around them. If you see your neighbors running and riding day after day, then you’re more likely to try it yourself. Social support in Boulder means your friends meet for a ride rather than a beer — or, rather, a ride and then a beer. Wake up early enough and you can see those dynamics at play in the Wednesday Morning Velo, a.k.a. the banker’s ride. Slightly past 6 a.m., bicyclists in tight shorts and clickety shoes flock to Amante, the north Boulder coffeehouse that doubles as a rider’s hang. “Where we headed today?” one silver-haired gent asks. “Up to NCAR is what I heard,” his friend answers. NCAR is the National Center for Atmospheric Research, one of the many federal research institutes that keep Boulder flush with scientific talent. By 6:20 the joint is packed with bankers, lawyers, startup CFOs, and venture capitalists. There are so many riders that they have to split into three groups: threshold, tempo, and endurance. Boulder exercise is social exercise. The tone-setter is the BolderBoulder, the annual Memorial Day 10K that turns the entire town into a jogging party. More than 50,000 people — almost half of Boulder’s population — run, jog, juggle, walk, and roll the 10K. Long before Americans raced Tough Mudders, color races, and rock & roll marathons, the Bolder­Boulder put the fun into the 6.2-mile run. In this town, exercise isn’t a chore — it’s a reward. I heard that a lot. The comment usually came near conversation’s end, and it invariably touched on Boulder’s lack of economic and ethnic diversity. How ever white and wealthy you think this town is, it’s even whiter and wealthier. You’re four times more likely to encounter an African-American in Lincoln, Nebraska, than you are in Boulder. The zoning laws that preserve the town’s human scale and open space also prevent most housing development. The fit, outdoor-loving, creative class is migrating to Boulder and squeezing out the working class, the dirtbag climbers, the Zen philosophers, and the ancient hippies nursing cappuccinos at the Trident Café. The homes that were once group rentals for marathoners now get snapped up in all-cash bids by ad execs or tech geeks and their $5,000 Colnago road bikes. According to Zillow, the median home price shot up from $490,000 in 2013 to $696,000 in 2015, and has soared more than 15 percent in the past year alone. With every listing that closes, Boulder gets a little fitter, whiter, and wealthier. This town once welcomed weirdos. Now it welcomes winners. Take Smith. The 43-year-old entrepreneur personifies the kind of person who now thrives in Boulder: one who notices the sparks thrown off by the town’s subcultures and captures them to tender new business ideas. Raised in California, Smith came here in the early 1990s to attend college and ski, not necessarily in that order. After graduating, he hung around and co-founded a medical rehab facility. A few years later, in 2005, he and a college buddy, Brandon Dwight, opened Boulder Cycle Sport. Both had been competitive riders in their twenties. “Just what Boulder needed, another bike shop, right?” Dwight said when I later dropped by the store. “But we thought we could make it work.” They did, based on their notion of creating community. “Cycling advocacy, group rides, junior cycling, sponsoring a professional cyclocross team — that was how it grew,” Smith said. This entry was posted in Uncategorized on March 9, 2016 by Tracy Zaik. An unlikely story of tree-huggers, commies, eggheads, and gold. When the Wall Street day-trading firm where Kate Maloney worked opened a location in Boulder in 2001, she jumped at the chance to move. “We’d wake up at 5:30 in the morning, tackle the market, and then go hiking up Sanitas, or rock climb in the Chautauqua,” she recalls. In 2007, Maloney founded TherapySites, a website design company that now sells Web templates to a wide variety of health care practices. Maloney has 34 employees, a handful of whom work out of her downtown Boulder loft. We had barely started our tour of the Chautauqua, Boulder’s verdant 19th-century park, when my guide for the morning, local historian Carol Taylor, handed me the packet with the “cautionary tales.” They were photocopied news articles, all from national publications, all featuring Boulder and all written–in Taylor’s mind, anyway–by superficial out-of-towner nincompoops. “Namaste and Pass the Naan,” read one’s subhead. “You will be hard-pressed to find one person here, including your 85-year-old grandmother, without a six-pack,” read another. Over four decades, as Taylor’s packet meant to show, writers had missed the town for the lovely trees (and bike paths and mountain views)–unfairly reducing Boulder to a playground where smug eco-liberals puffed legalized marijuana and compared triathlon times. Out from the gleaming sunlight, a Lycra-clad cyclist whizzed majestically by. per capita as runner-up San Jose-Sunnyvale in California. This vibrant culture has given Boulder a prosperous economy: Without the help of oil, natural gas, or any monolithic industry, Boulder County (population 300,000) ranks among the top 20 most productive metro areas in terms of GDP. Unemployment is 5.4 percent–almost two points below the national average and a full point below the Federal Reserve’s goal for the nation. It is the home to a start-up incubator, Techstars, and a healthy venture capitalist community. Boulder as start-up haven is not a new development, either. Since 1960, it has quietly nurtured nascent industries, including natural foods, computer storage, biotech, and now Internet companies. It’s the original home of Ball Aerospace (one of the first NASA contractors), herbal tea pioneer Celestial Seasonings, StorageTek (later acquired by Sun Microsystems for $4.1 billion), and the biochemistry lab that led to Amgen. But Boulder wasn’t always so affluent, so collegiate, so pretty. The history of Boulder, the start-up haven, is a fascinating story of a community that built itself from scratch through a combination of individual effort, shared sacrifice, and counterintuitive choices (not to mention a near-constant urge to skip out of the office and get outdoors). Its success is a very specific, and in some ways limited, way of fostering a local economy. 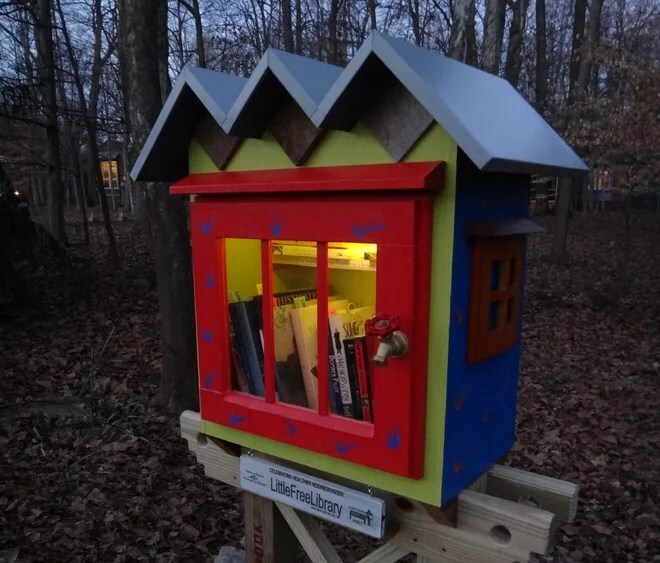 But it offers an unexpected solution to how cities all over the U.S. could make themselves a welcoming spot for start-ups. But a streak of exceptionalism ran through Boulderites. They displayed a deep commitment to city beautification and education. In 1877, just six years after Boulder officially incorporated, citizens persuaded the state legislature to make it home to Colorado’s first public university; 104 families donated land and money to build the campus. In 1889, the citizens voted to issue a $20,000 bond to build the Chautauqua, a place where visiting Texas schoolteachers could hike, picnic, and listen to lectures–a sort of bucolic TED Conference of the time. In 1908, citizens hired landscape architect Frederick Law Olmsted Jr. (the son of the legendary creator of New York City’s Central Park) to consult with them on how best to plan the city–a precocious move for a town of 10,000. His recommendations included putting wires underground and keeping streetlights beneath tree level, and he cautioned them about suburban developers, “dirty industries,” and pandering to tourists. Above all, he said, Boulder must be beautiful–a prosperous town where people would spend their lives, not just make their money and get out. “As with the food we eat and the air we breathe, so the sights habitually before our eyes play an immense part of determining whether we feel cheerful, efficient, and fit for life,” Olmsted wrote in his report. Boulder might have remained a sleepy pretty college town, were it not for the communists. In 1949, fearful of a Soviet nuclear attack, President Harry Truman issued an order to stop the clustering of major buildings in Washington, D.C. The nation’s basic research labs had to expand elsewhere. Boulder citizens, sensing an opportunity, bought up 217 acres of land and beat out 11 other cities to make that site the home of the National Bureau of Standards’s new Radio Propagation Laboratory. At first, the D.C.-based scientists bristled, considered it an exile. “They would say, ‘Where do we go to see the Indians?’ ” says R.C. (“Merc”) Mercure, one of the founding employees of Ball Aerospace, who was a physics graduate student at the University of Colorado at the time. Alabama native Dale Katechis settled in Boulder in 2004 after he ran out of money on the way to Montana. He knew he was in love when he spotted the Flatirons mountains rising up behind the city, he says. Since then, he has started a brewery, restaurants, and a boutique bike company in Boulder. He has also developed his own take on vertical integration: His brewery’s spent grain feeds the cattle on his ranch, which is located outside the city. The cattle, in turn, provide the beef used in his restaurants’ burgers. But the move put Boulder on the U.S. government’s map. In 1952, the federal government made greater Boulder the site of Rocky Flats, a 27-building nuclear weapons manufacturing facility. After the Department of Defense ordered sophisticated rocket pointing controls from CU’s labs, researchers, including Mercure, left to form Ball Aerospace, which filled those contracts and others. Eventually, the government made Boulder the site of the National Center for Atmospheric Research, and IBM moved its tape drive manufacturing division out there, which later led to the founding of storage start-ups StorageTek, Exabyte, and McData. On the backs of these technology jobs, Boulder’s population doubled from 1950 to 1960 and then jumped to 67,000 10 years later. Celestial Seasonings was among the first of many natural-foods companies, including White Wave, maker of Silk-brand soy milk; Horizon Organic Dairy; and Alfalfa’s, a specialty market akin to Whole Foods. For these sorts of entrepreneurs, Boulder was an ideal test market. Given its population of affluent, outdoorsy types, brands could test new ideas with a friendly group of consumers in the local markets, work out the kinks at low risk, and then take the successes to a more general market in Denver and beyond. “I just got so much support. Everybody believed,” says Siegel. With industry picking up and the population booming, the city could have stoked the growth, welcoming developers in to build out new housing and offices. Instead, it did the opposite. In 1959, the city drew a line across the surrounding mountains, above which it would not provide water or sewer services–purely in order to protect the view. In 1967, residents instituted a special 0.4 percent sales tax to purchase “green space” around the city, stymieing developers, heading off major roadways, and preserving nature. Next, the city limited new housing starts to just 2 percent a year. Now the county manages more than 97,000 acres of open space. Boulder is in a bucolic bubble, with the Rocky Mountains on one side and parkland on the other. Encircling the city with green space has had several implications for Boulder, some expected and some not. Though never exactly cheap before, the limited space has resulted in sky-high real estate prices–with a median price of $431,200, single family homes are 1.5 times as expensive as in Denver. Meanwhile, as the preserved space flourished, so did the deer population–and the hungry mountain lions, which commuted in to eat the deer and, occasionally, attack citizens of Boulder. Mo Siegel started Celestial Seasonings in 1969. Back then, he sold his tea in health-food stores in Boulder (at the time, there were only three such shops). “Boulder was really conducive to the natural-foods industry,” says Siegel. “Everybody’s so healthy. If you don’t run or bike or ski–or hike or climb–you really can’t live here.” Now, of course, natural food is as ubiquitous nationwide as Celestial’s Sleepytime tea. The green border, paired with the city’s conservative zoning and development laws, has also meant that national retailers–or any monolithic competitor–have trouble finding good spaces to open in Boulder. Meanwhile, the city’s hard line against expansion doesn’t really allow its own start-ups to grow much past a certain size. The result? The town has made itself a physical incubator for small businesses. “After companies reach 500 employees, they either have to move out to the other side of the open space or sell,” says Kyle Lefkoff, a general partner with Boulder Ventures since 1995. But for those who can afford the housing, steer clear of the mountain lions, and squeeze into its limited office space, Boulder affords an incredible quality of life–along with a place to do business. The planning strategy, which at first seems antibusiness, simply favors those who are in it for the long haul–those who are thinking about raising families and living in Boulder until old age, and weeds out those that would dive in because of a juicy tax incentive. There are entrepreneurs like Phil Anson, who came out after graduating from college purely to bum around and climb. A onetime line cook, he started selling premade burritos out of a cooler to support himself. In time, he found he liked scaling that business better than scaling rocks, and Evol Burritos, his 73-employee company, now distributes to supermarkets nationwide and rang up $12.4 million last year. There were those who arrived in Boulder by accident and fell in love. Matt Larson, founder of Confio Software, moved there because his biggest investor told him he had to as a condition to getting funded (the man lived in Boulder and wanted to be chairman but didn’t want to move). Alabama native Dale Katechis ended up in Lyons, the town just north of Boulder, after he and his wife ran out of money on the way to Montana. Katechis started waiting tables. Then he opened his own restaurant, Oskar Blues Brewery, and started brewing beer as a way to get his eatery’s name out, and found the beer sold better than the food. (His brewery, which sells Dale’s Pale Ale, made $33 million in sales last year.) Little Lyons “was like Mayberry in the mountains,” Katechis says, his voice tinged with the last remnants of an Alabama drawl. There are those entrepreneurs who moved to Boulder when they were older, when they already had money, almost as a reward to themselves. In 2001, the Wall Street day-trading firm where Kate Maloney worked opened an office in Boulder, simply because she and some co-workers thought it would be more fun. Six years later, she started TherapySites, a Web company she runs out of a loft apartment downtown. In 2006, adman Alex Bogusky moved a chunk of Crispin Porter + Bogusky, the advertising agency he co-founded, from Miami to offices in Gunbarrel, a town eight miles northeast of Boulder. To Bogusky, outdoor sports lovers and entrepreneurs share a common DNA: “Thrill seekers are drawn to this place,” he says. “Once you get out here, you want the ultimate thrill in business, too, and that’s start-ups.” By the time Bogusky retired from the agency, the Boulder office of Crispin Porter + Bogusky had swelled to more than 700 employees–many of whom had moved from Miami. After earning three degrees from the University of Colorado in Boulder, R.C. (“Merc”) Mercure became a founding employee at Ball Aerospace in 1956. “Ed Ball took us aside and asked us if we would consider getting into the electronics business,” Mercure recalls. “A few of us said, ‘Why not?’ ” Ball went on to land a contract with NASA and helped put a solar observatory into orbit. And finally, there are those who came out of the University of Colorado and couldn’t imagine going anywhere else. The most famous is probably Marvin Caruthers, who, as a biochemistry professor in 1980, helped start the biotech firm Amgen. His co-founders decided to put company headquarters in Thousand Oaks, California, but Caruthers kept a lab in Boulder. Since then, the University of Colorado has become a destination for DNA and RNA research. Veterans of his department, of Amgen, and of the university’s biology departments would go on to start biotech firms, including Applied Biosystems, Dharmacon, Myogen, and Pharmion, companies that sold for more than $6 billion altogether. Of course, Boulder’s not perfect. Many businesses would struggle to exist there, especially those that require heavy equipment or a low-wage work force. Its regulations, and its constricted land area, heavily favor small companies. In fact, several start-ups, including Internet security firm Webroot and StorageTek, grew out of the town, choosing to move out to a sprawling office across the green space in neighboring Broomfield. But many other entrepreneurs decided to sell out and stay–and join Boulder’s growing number of angel investors and venture capitalists, the next step in the city’s development. Mo Siegel now invests in other natural-foods companies. Caruthers helped start Boulder Ventures, which invests almost exclusively in Boulder entrepreneurs. All together, venture capital firms invested $587 million in Colorado in 2012–a far cry from major venture hubs such as Silicon Valley and New York City ($11 billion and $2.3 billion, respectively) but significant. They would rather do that than move to some tony retirement place–because in their minds, Boulder beats ’em all. That’s the thing. Pretty much every entrepreneur told me he or she started up in Boulder or stayed in Boulder for that same reason: It’s a beautiful place to live. And it’s beautiful not because the city forefathers had some nifty pro-start-up policy–but because they had the foresight to plant lots of trees, welcome a university and federal science labs, buy up lots of parkland, and then stay disciplined about preserving the beauty they had created. The idea was simple: Make a city a great place to live, and people figure out how to make a living there. Correction: Internet advertising startup Trada has 15 employees. An earlier version of this article noted its size prior to layoffs that occurred after the magazine went to press. This entry was posted in Uncategorized on November 6, 2014 by Tracy Zaik. The announcement a couple weeks ago that Twitter is buying Gnip is a big deal for Boulder. And the fact that Twitter loves it here and plans to expand the local team makes it even bigger. This move by one of the hottest companies on the planet reinforces Boulder’s image as a major tech hub in the same league as San Francisco and Boston. That is pretty amazing. Twitter joins Google, Microsoft and hundreds of startups that have chosen to locate here. In my job, I talk to people in the tech world fairly often, and, for the most part, Boulder gets a big thumbs up. Most CEOs are committed to staying here and growing their companies in the place they love. But even startup paradise is not without its troubles. In some ways, Boulder is becoming a victim of its own success. Some of the challenges we face include a shortage of office space, housing for employees and, of course, parking and transportation. Let’s take office space first. One of the things entrepreneurs love about Boulder and downtown in particular is the amazing density of startup companies. Our coffee shops, bars and restaurants are literally buzzing with energy from hundreds of tech and creative firms and their employees. And now we’re running out of room for all these young firms to grow. The cost of office space is going ever higher as the vacancy rate hovers close to zero. Fortunately, there are new developments coming downtown and in Boulder Junction that will replace and upgrade a few of our tired buildings with more functional space. Over the next two years, we expect to add about 10 percent to our existing downtown office capacity. That will certainly help but Boulder will likely always face a shortage of space and some firms will always have to leave or open additional offices elsewhere. The cost and availability of housing affects everyone in Boulder, including tech firms. Most top executives live in town and many live downtown. They can afford the high prices. Likewise, many of their twentysomething employees live here in tiny apartments or with roommates that make it affordable. It’s those in the middle who get married, have kids and need more space that get squeezed out and are forced to commute from further and further away. Fixing the housing crunch is a priority for the City Council and staff this year. While I applaud the effort, I doubt if they will make much progress. 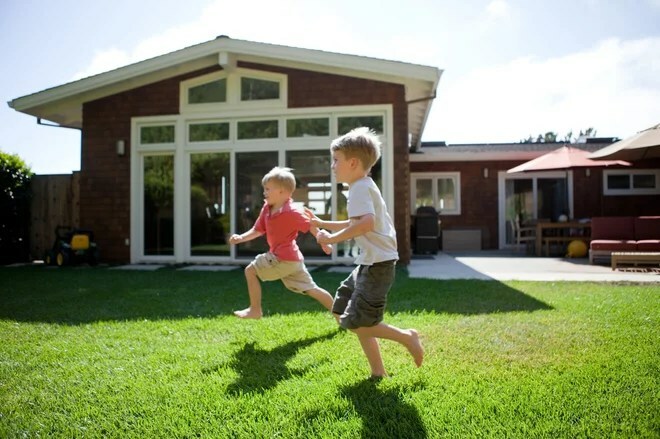 Most people in their 30s and 40s with young kids want a house with a yard. The days of building those in any “affordable” way in Boulder are long gone. Which brings us to the third problem. All those employees who move out of town for an affordable house have to get back to Boulder every day to work. In a brilliant move many years ago, the city created a downtown EcoPass program that is now a national model of success. Parking revenues are used to provide free EcoPasses to all full time employees in the downtown district. This program along with our outstanding bike network has resulted in more than 60 percent of downtown employees commuting without their cars at least part of the time. This is great news and helps with Boulder’s sustainability and climate action goals. However, many employees live in areas that are not well served by transit and they cannot jump on a bus or a bike to get to work. They have to drive and we should not punish them by making it impossible to park. Discouraging or even prohibiting adequate parking as new projects are built will eventually backfire and force jobs and economic vitality out of Boulder. These jobs will not disappear. They will just move further away, which will result in more people driving even further. That is an outcome which benefits no one. The shortage of office space, housing and parking will always be with us and we will never totally solve them. In fact, all three are related to the huge appeal of Boulder as a place to live and to work. So welcome Twitter. I hope you find some room to grow and at least a few places to park! Sean Maher is executive director of the Downtown Boulder Business Improvement District and Downtown Boulder Inc. The views expressed here are his own and not representative of either organization. This entry was posted in Uncategorized on April 28, 2014 by Tracy Zaik. Although we all know this stuff…..always good a good reminder. The “For Sale” sign is up. You’ve completed the big projects and the little tweaks, so you’re hopeful your efforts will pay off with a quick and profitable offer. But now comes the most critical part of the home-selling cycle: the day of a showing or an open house. A negative first impression can directly translate into dollars off a full asking price. 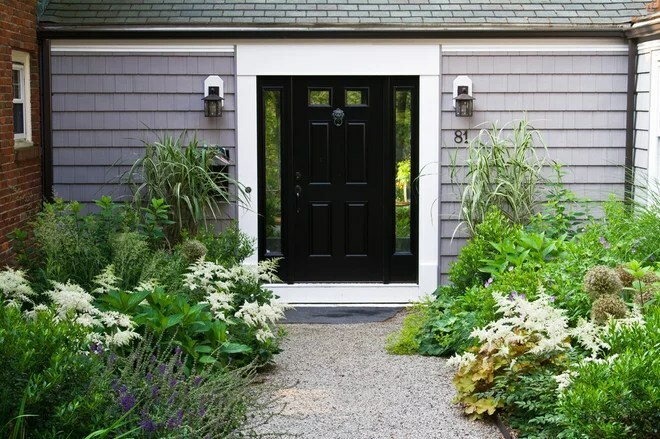 Before opening the door to potential buyers the day of a showing, follow these tips from top Realtors and stagers all over the world. 1. Detach from the stuff. Home experts agree the first and most important step to a successful listing is to emotionally separate from the house and the objects within it. “Many clients I work with battle to let go of their property and refuse to take down family photographs and religious items,” says Gregg Churchill, owner of Mr. Home Staging & Design in Perth, Western Australia. Letting go of the emotional connections to the items inside the home will make you more objective about any necessary changes and more open to Realtor and buyer feedback. To ease the selling process, embrace the idea that your house is a commodity that needs to be sold, and transfer any emotional connections to your new destination, Churchill advises. Don’t forget: Foyer tables, fireplace mantels and refrigerator doors are popular display spots for loads of personal items like holiday cards, children’s artwork, pictures and trophies. Pare down or clear off these spots for showings. 2. Make sure it looks clean. Cleaning seems so obvious, and is inexpensive, but the lack of it is one of the biggest complaints agents hear. Hopefully, you’ve done the big scrub leading up to open-house day: carpets steamed, floors mopped, windows wiped, appliances scoured. But on the day of a showing, don’t overlook little details like crumbs on the table from breakfast, toothpaste remnants in sinks, half-full trash cans on display and dust bunnies in rooms you don’t frequent. Do a quick walk-through with a duster, reaching into recessed lights and corners, suggests Charlie Buckley, associate broker at Mr. Waterfront Team at Long & Foster Real Estate in Annapolis, Maryland. Straighten the bedspreads in all the rooms, put away loose shoes in hallways and tuck away pet beds and bowls, Buckley says. For added visual appeal and a more spa-like vibe, switch to new, clean towels just before a showing, say Liz Larson and Jan Poulain of Perfectly Placed for You in Chelmsford, Massachusetts. Don’t forget: Wipe down surfaces that people would naturally touch, such as stair banisters, hand rails and items that have inviting textures. “People love touching things. Textures change everything, as they propel people into various good spots in their memories. Candles. Shells. A leafy houseplant that says, ‘Touch me,’” says Mathieu Nakkach, CEO of Signature Stagers in Dubai, United Arab Emirates. 3. Make sure it smells clean too. Besides a home’s visual appeal, nothing triggers more comments than scents. Diffuse cooking, pet and musty odors by airing out the home with open windows or air purifiers. Comforting smells, like baking bread or brewing coffee, can be appealing to most potential buyers. “I always recommend fresh flowers. Cider on the stove in the colder months is a nice touch,” says Travis Gray, an Annapolis, Maryland realty agent at Coldwell Banker. But beware of strong spray scents, candles or other products. “Don’t leave plug-in air fresheners around your home. Some people are allergic to scents, and it only highlights that you have an odor problem,” says Monique Shaw, chief designer at Homes Sold Beautifully in Calgary, Alberta. Don’t forget: Pet foods, toys, litter boxes and blankets may have distinct smells. Stow these items or take them out of the house during showings. 4. Remove sight-line impairments. 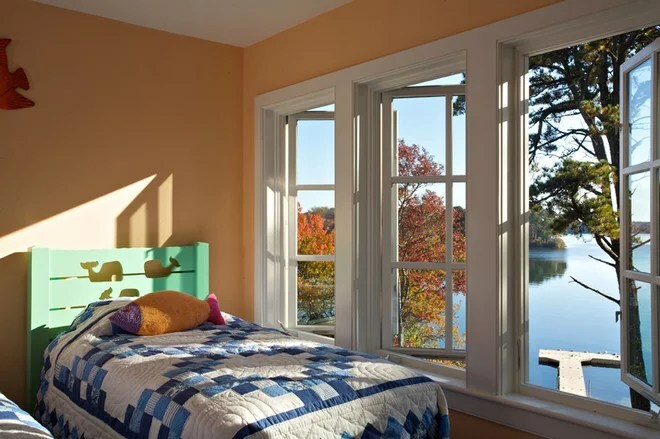 Artists, architects and designers are well versed in the simple trick of drawing the eye to something appealing, whether it’s a unique color, the next room or a special view. Eliminate items such as knickknacks, toys, small appliances and bath products that stop the eye, or worse, make spaces look smaller. 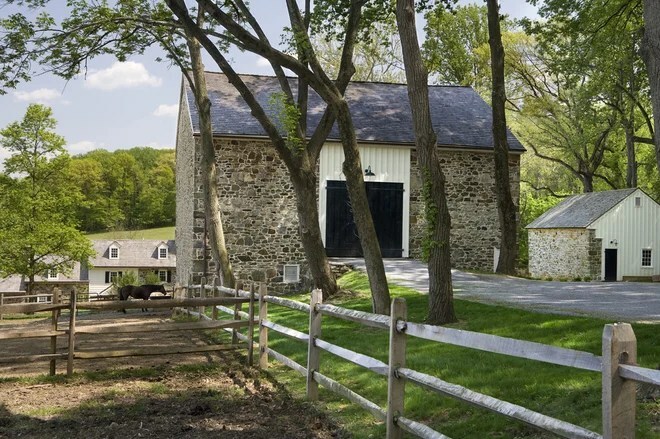 “I am selling the space and finishes of the house, not your personal property,” explains Beth Tyler, a Realtor at Long & Foster in Annapolis. Though many rugs add warmth and color, consider rolling them up if they break up a room disjointedly or if they obscure attractive selling points like stunning hardwood floors or beautiful tilework. “Bathrooms, especially small ones, will look bigger without the rugs. If it’s a huge master spa bath with a coordinated rug, then it can stay if it warms up a big, cold space,” Tyler says. Have bins or baskets on hand to clear off countertops, floors, tables and desks. “It’s a lot easier to put away one or two small bins than it is to have to find a spot for 15 different toiletry items,” says Annie Pinsker-Brown, owner of Stage to Sell in Los Angeles. Don’t forget: Store tablecloths and dish towels to accentuate a kitchen’s workspace and appliances. “Kitchens look bigger if your eye does not stop at the dishtowel on the oven, dishwasher and sink,” Tyler says. 5. Improve traffic flow. 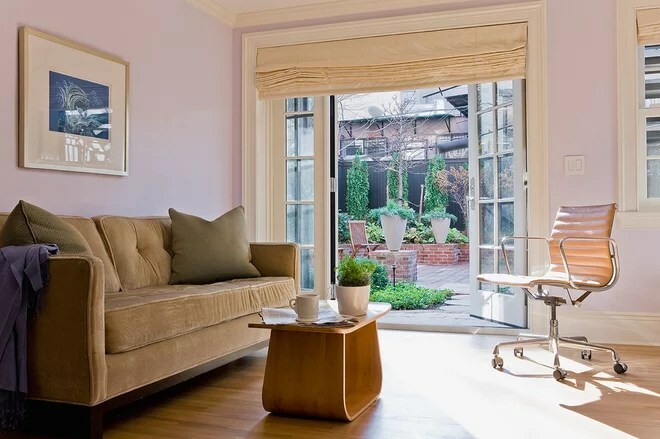 Over time, homeowners become desensitized to what their possessions look like and where they are placed, note Laura Grindrod and Carolyn Kibby of Annapolis Staging and Design. The coatrack by the kitchen door, for example, might be practical for your family, but it can look like poor storage to a potential buyer. Walk through each room and determine if the furniture arrangement contributes to a comfortable flow and use of space, or if it simply is that way because that’s how it has always been, Grindrod and Kibby advise. Don’t forget: Too little furniture can be just as bad as too much. A tiny couch in a large family room might prompt buyers to worry they’ll never be able to furnish the whole space. If needed, repurpose pieces from spare rooms to comfortably fill out an area. 6. Create the “Goldilocks Effect.” No matter what time of day or year, the home’s temperature, lighting and noise levels should be just right during an open house. Room temperatures should be not too hot and not too cold. Blinds, shades and drapes should be open, and lights should be on, says Margaret Melvin, a Columbia, Maryland, associate broker at Prudential PenFed Realty. “A dark house may work when filming a vampire series, but not for selling a house,” she says. Don’t forget: Let in pleasant ambient sounds, from birds chirping outside to a soothing water feature. Calming music in the background, high enough to hear but low enough to not overwhelm, can do wonders, Nakkach says. 7. Be strategic about handouts and valuables. Documents about the home, especially with attractive photos, should be readily accessible. “I prefer that property brochures and information are in the foyer area, located on a console or table with some fresh flowers. Buyers can pick up that information upon entering or leaving,” says Melvin. Whether it’s an invitation-only showing or a large opening for the masses, it’s important to safeguard valuables, personal information and sensitive items. Stow small items like electronics, jewelry and prescription medications, and protect financial statements and documents, recommends Pinsker-Brown. Don’t forget: “Shut off and password-protect computers too,” Pinsker-Brown adds. This entry was posted in Uncategorized on March 25, 2014 by Tracy Zaik. To really understand Boulder, you have to realize it is more than just a group of residents and restaurants. Boulder is one of the coolest, hippest, funkiest cities in the country! Boulder gets nearly as much sunshine as Phoenix, but without all the heat. Sunscreen is a must, but don’t forget to protect your eyes, too. Grab a pair of trendy sunglasses or prescription glasses at Aspen Eyewear. Trust me, you’ll need them. This brick-lined pedestrian mall features upwards of 1,000 businesses. With 85 percent of them locally owned and operated, you get to experience an eclectic assortment of restaurants, shops, and activities. On Pearl Street you can see dancers, jugglers, fire-eaters, musicians, magicians, and there’s even one guy who has memorized every zip code in the country! Boulder is a very active city, you’ll always see people out walking, running, biking, rollerblading, mountain climbing, kayaking—you name it, they do it. And they love it! The best place to find gear from camping and hiking to snowsports and trail running, is at MontBell. The best place to get fit is Flatirons. Formerly the Flatiron Athletic Club, this is the epicenter for world-class triathlon training. Many of the coaches are world champion Ironman winners and Olympic gold medalists. 5. So You Want To Be An Olympian Or A Pro Athlete? It’s not unusual to see Iron Woman Chrissie Wellington, among other professional athletes, running down the streets of Boulder. Mild weather and high elevation attracts athletes from all over the world to train year round. The Dushanbe Teahouse has great food, tea and atmosphere. But what’s really interesting is that it was completely built by hand in Dushanbe, Tajikistan, a sister city to Boulder. Over 40 artisans worked on the tea house for three years. It was then disassembled and gifted to Boulder in celebration of their city sisterhood. It’s a major government research hub. NCAR, NIST, and a large office for NAOA call Boulder home. Next time you’re sitting in Amante Coffee and overhear some grey-haired guys with ponytails talking about global warming, they could very well be top scientists doing the leading research in their fields. Breweries and craft beers abound. Avery Brewing has 21 different craft beers on tap, and when it’s in season don’t miss the Chocolate Mint Stout. Other microbreweries to try are Boulder Beer, Upslope Brewing, Twisted Pine and Mountain Sun/Southern Sun. I really hope you get my reference to Robin William’s break out comedy show of the late ’70s. Many scenes for this fun science fiction comedy were shot all over town. You can still view the private residence from the street at 1619 Pine Street. It is located in the heart of the old town area, which is full of colorful historic Victorian homes flanked by stone sidewalks and beautiful flower gardens. While the city’s not going to the dogs anytime soon, dog owners can take their furry companions everywhere from parks and trails, to outdoor cafes. You have five different off-leash dog parks to choose from. One of the best is the East Boulder Community Park on Sioux Drive. Your pet pal can go for a swim in the pond and there’s separate play areas for small dogs. Boulder is nestled in a small valley tucked into the edge of the Rockies. Cool mountain breezes off the foothills keep the city from ever getting too hot in the summer, and winter weather doesn’t start until late; sometimes not until January. While you may be tempted by their beauty, don’t move too close to the foothills, which are subject to wildfires from time to time. They may be gorgeous, but you can still see them through your window from a safe distance and keep your house out of the line of fire. Literally. Snowfall averages more than 80 inches per season—that’s a lot of shovelfuls. Do yourself a favor and invest in a snow blower—you’ll thank me. You can get them at McGuckin Hardware. This is the most beloved hardware store in town and it’s every retired guy’s dream to work in this place. Being that Colorado was one of the first states to legalize medical marijuana, it’s no surprise that Boulder has about 28 dispensaries in its 25.68 square miles. With the state’s recent legalization of recreational pot and a push toward regulating, taxing, and distributing marijuana to adults, there’s even more potential for budding entrepreneurs. There are numerous holistic health centers, alternative healing practitioners, and spiritual healers in Boulder. As one friend who is a Shaman and Reiki Master says, “The market is saturated here.” Check out Alexander Love for holistic healing, natural medicine, acupuncture and more. University of Colorado Boulder is a top-rated school and receives huge research grants. Eighteen astronauts, 11 Nobel Laureates, and eight MacArthur Fellows have been associated with CU-Boulder as students, researchers, and faculty members. If you are a Boulder resident, you have lots of open classes and events available at CU-Boulder including science, music, concerts, guest lectures and more. In Boulder taste buds rule. You’ll discover tasting events all over the downtown area: Taste of Boulder Downtown Dining Tours, Cocktail Tasting Tour, Beer Tasting Tour, Chocolate Baking Lab 101 at Piece, Love and Chocolate, Wine Wednesday at Beehive…the list goes on. With so many restaurants focused on locally grown foods, there are numerous choices for vegans and vegetarians. Leaf Vegetarian Restaurant has raw, vegan and gluten-free options as well. Try the gnocchi, and the raw chocolate “cheesecake” is to die for. Your social calendar will always be full. Just head over to downtownboulder.com and find out what’s happening from free concerts, to poetry readings, to art classes—you can find them all. Big Head Todd and The Monsters got their start more than 20 years ago in Boulder. These CU alums and hometown heroes have produced billboard hits like “Sister Sweetly” and “Beautiful World.” They hold a special place in the hearts of Colorado fans, and they love coming back to play at home. And we like it too! Just 45 minutes away (and worth the drive), Estes Park is located in the town of Estes. This Rocky Mountains National Park has something for everyone. You can stroll along Lily Lake, do a car tour of wildlife, or walk the Knoll Path for amazing views of downtown Estes. In the winter try your foot at snowshoeing or for the really adventurous, ice climbing. It’s a perfect stop on your way to Estes Park and the gorgeous Rocky Mountains. The eggs benedict is amazing or try their veggie benedict. For something totally different order their smoked wild salmon hash. Don’t miss the chai—it’s super delicious. Boulder has over 35,000 acres of publicly accessible protected land with miles of walking, hiking and biking trails that meander through the diverse landscape. I told you it was an active place. It’s easier to get around by bike than car and bike lanes are aplenty. Just about everyone in Boulder rides a bike, and if you don’t have a bike, that’s OK, you can pick one up from any Boulder B-cycle bike-sharing station. Boulder is an easy hour-and-a-half drive to top ski areas such as Breckenridge, Keystone, Copper Mountain, and Arapahoe Basin. While my favorite is Breckenridge, you can stay local and visit Eldora Mountain at the top of Boulder Canyon if you don’t want to drive out of town. Yep, you are giving up the coast for the mountains here, but if you crave the feeling of the sand between your toes, go for a swim at the Boulder Reservoir. It’s a great place for boating, swimming, sunbathing, water skiing, and fishing. For every trash can in Boulder there are at least three recycle bins. Boulderites take their carbon footprint seriously. In fact, Boulder is on its way to becoming the “most green city worldwide” by 2020. There’s the Boulder Museum of Contemporary Art, the annual Boulder Bach Festival, and each summer we have the Shakespeare Festival both indoors and outdoors under the summer night skies. Plus, there are tons of art galleries featuring hundreds of local artists. This entry was posted in Uncategorized on February 18, 2014 by Tracy Zaik. Many of us find ourselves living in communities defined not by common acquaintances, knowledge and culture, but by geography or economics. Rather than knowing our neighbors from childhood, we may not know our neighbors at all. To create a sense of community, it’s often necessary to bring people together so that they can get to know one another. By creating spaces where members of a neighborhood can mix naturally, communities can become communities in the true meaning of the word — places where people not only live together, but care about and watch out for one another.Encompassing the sidewalk, the front yard and walk, and the front porch, here are some ideas to help foster interaction with your neighbors. 1. Shade the sidewalk. Consider placing a tree where it will shade the sidewalk to help create a pleasant environment and encourage walking and visiting among neighbors. Trees provide rain and sun protection, and temperature differentials of 5 to 15 degrees are felt when walking on tree-canopied streets. 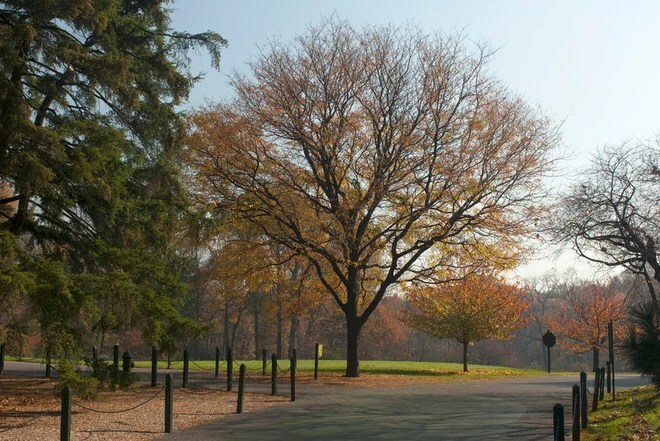 In urban areas trees help mitigate the heat-island effect and provide a connection to nature.Most cities require permits for adding trees to a parkway (or hell strip), but permits are not usually required for planting on private property. 2. Set the fence back. 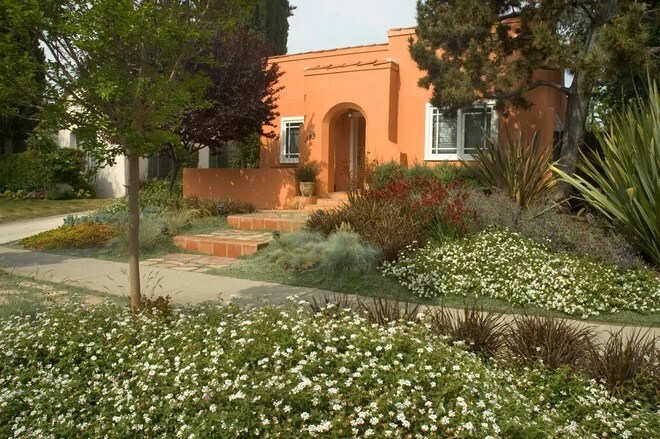 Placing a low fence or wall back a few feet from the edge of the sidewalk allows room for planting, and plants provide visual interest for pedestrians. In addition to cheerful daisies like these, velvety plants such as lamb’s ear (Stachys byzantina) would work well. 4. Try the funnel effect. Increasing the width of your home’s central path or stairway can help guide visitors to your door. 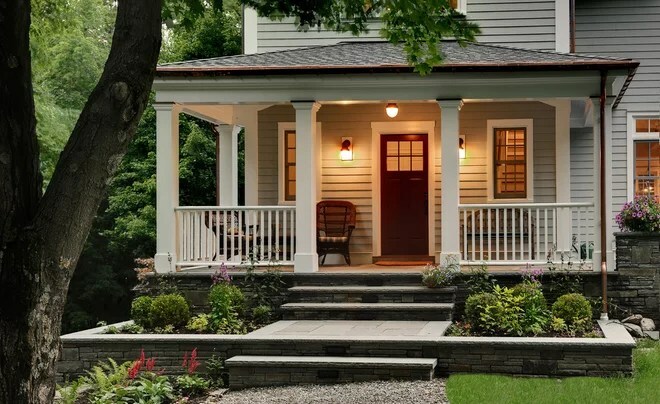 Here tiled stairs are double the width of the home’s porch opening to help direct visitors upward. The stairs’ deep risers also double as seating for friends and neighbors. Full of color and texture, low-water greenery is planted at an angle and carefully tiered to keep the views to the neighborhood open. 5. Light the way. This one is a no-brainer. 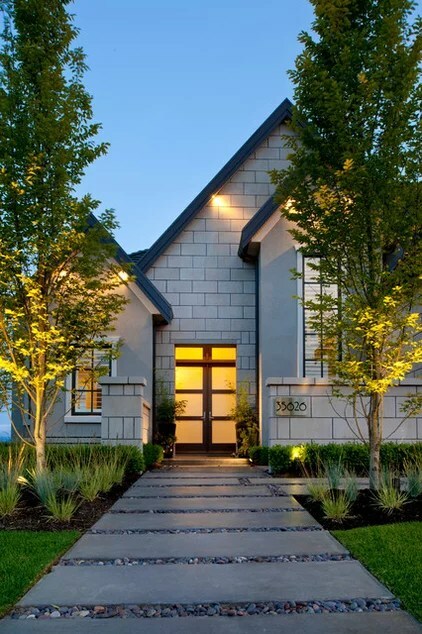 A means of welcoming visitors to your home at night, good lightingalso adds to safety and to the attractiveness of a front garden. It’s also a proven deterrent to crime.When lighting the front walk, take care to eliminate pools of light and darkness, which can be a hazard, particularly for elderly visitors. The goal is to have the walk evenly illuminated. 6. Create interest with plants. 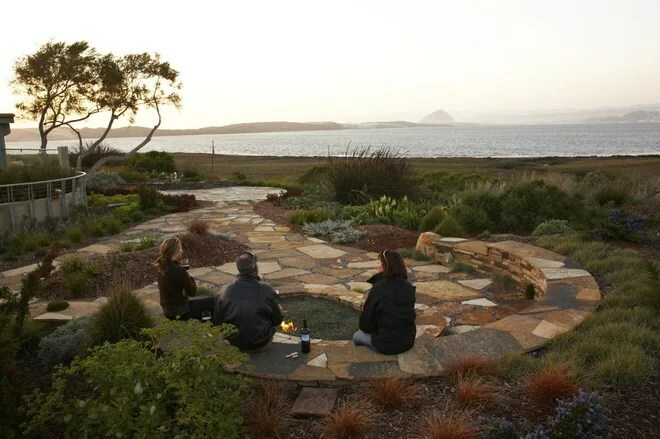 What you would like the experience of your front garden to be for your friends and neighbors? Richly textured planting designs help define the mood of the garden. 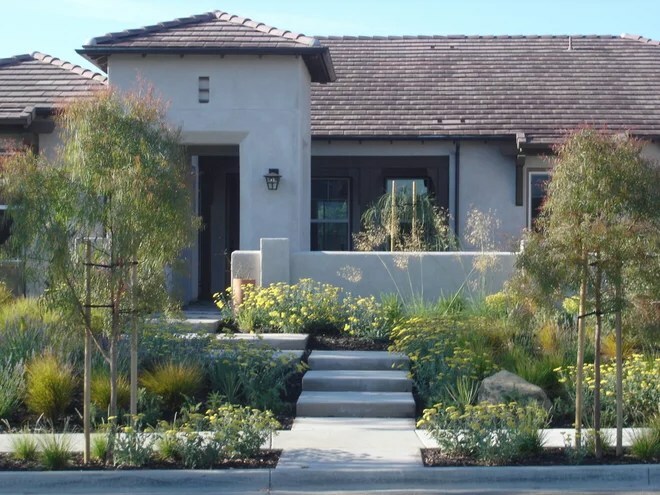 Consider using plants that are either native or adapted to the region in which your home is located. 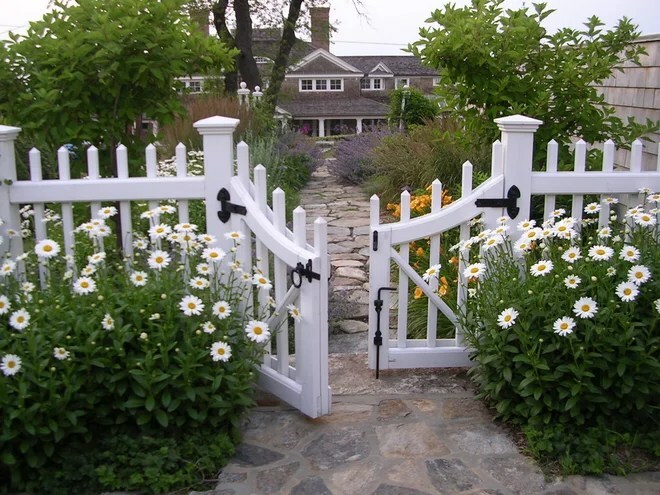 This can help tie your garden to your region, giving it an all-important sense of place, and make it more sustainable at the same time. 7. Create a hangout space. 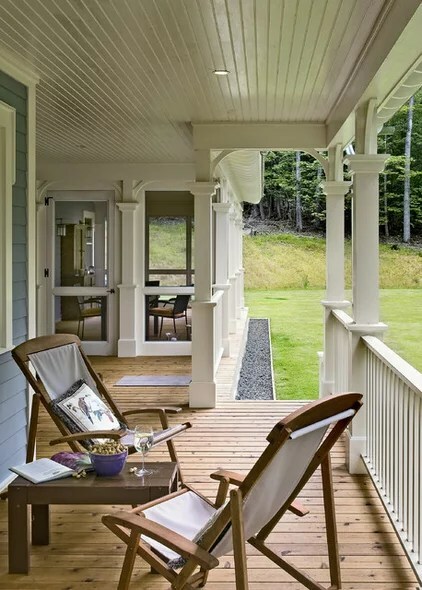 Do you like the idea of relaxing on the porch, watching and talking to neighbors who pass by, but don’t have a front porch? No problem. 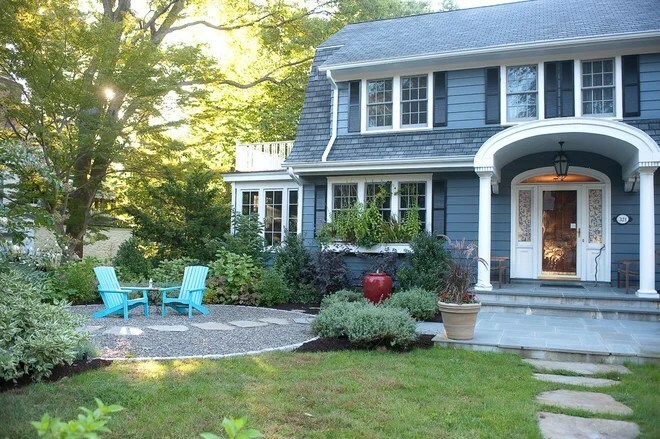 A seating area in the front garden, perhaps nestled amongst mature trees, can be a welcoming spot in which to hang out with family or neighbors. This entry was posted in Uncategorized on February 16, 2014 by Tracy Zaik. Where we live affects so much in our lives: the work we find, the friends we have, the activities we enjoy and even our health. If you are considering a big move — whether you are moving for work, to be near family or simply because you’re craving a change of scenery — following the steps below can provide you with a clear way to evaluate your new potential hometown. We will begin by focusing on the big picture (choosing a region), then we’ll zero in on a neighborhood and, finally, a street and a house. Let’s get started. Weather and landscape: Do you love seeing the seasons change, or would you rather live somewhere temperate? Do you enjoy getting out in nature to hike, swim or camp, or would you rather go shopping? 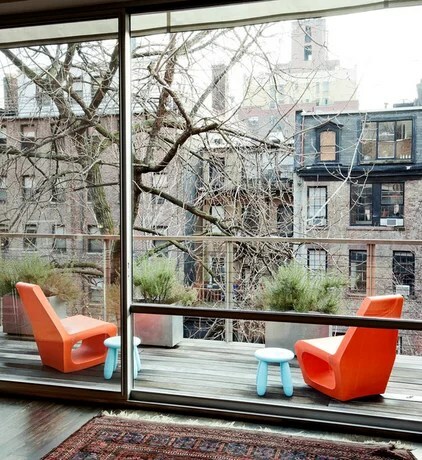 What sort of view would you love to see when you go outside? Mountains, beach, a city skyline, plains? Social and cultural amenities: Do you want to be near famous museums, a symphony orchestra or major sports teams? What about a lively music or arts scene, places of worship and learning institutions? Make a list, thinking about how near you would ideally like to be to each place — frequently visited places should go on your neighborhood list (we’ll get into that in a moment), but for others, being within a day’s drive might be fine. Family, friends and other connections: Of course, the people you know are one of the most important pieces of this puzzle. Living near family and friends can be a big reason to choose a place to live. Before moving away for a job, consider the impact it would have if you are no longer within driving distance of people you are close to. Send out feelers to see if there’s a distant relation or a friend of a friend whom you could connect with in your new town right away. Jobs and cost of living: This can be a delicate balancing act — in one place you may be able to get that great big house you’ve always dreamed of, but finding a job may be more difficult. In another place jobs may be more plentiful and highly paid, but if the cost of living is too high, you may find yourself scrambling to stay comfortably afloat. A cost-of-living calculator is an easy way to get a rough idea of how far your salary would go in another city — not all locations are represented in the one linked here, but it can be a good place to start. Walkability: The idea of walkability has been all over the place in recent years, and with good reason. Living in a place where you don’t need to jump in the car for every little errand can improve your quality of life — not to mention it’s healthier, because you will be walking more! You can find any neighborhood’s walkability rating on Walkscore. Neighborhood amenities: This is the fun part! Get out and explore your new potential community on foot. Seek and try shops, restaurants, markets and cafés. Look for walking and jogging paths, bike lanes, parks, libraries, schools and activities for little ones if you have kids. This can be tough to do if you are neighborhood hunting from afar, but try to explore neighborhoods firsthand before committing to an area. Proximity: As you consider a neighborhood, take into account its proximity to your work, family and friends’ homes, hobby locations and other favorite destinations. Of course the character of the neighborhood itself is important, but if you must commute for hours each day, you won’t have time to enjoy all it has to offer. Try to strike a balance, and avoid long commutes if possible. Try this: For one week pay attention to all of the places you go and write them down. Be specific — if you love visiting your local independent bookshop and natural grocery store, write that down, not just “bookstore” and “market.” Use your list when comparing potential neighborhoods. Schools: If you have children, finding a neighborhood that is in a good school district — or with access to good private schools if that is your preference — is essential. Check theGreat Schools website for ratings and reviews of public and private schools across the U.S. But also try searching local parents’ forums online, speaking with people you know in the area and visiting potential schools. There is only so much information a statistic can tell you; the rest you need to learn firsthand. Safety and crime: Just as with schools, there is only so much crime statistics can tell you about a neighborhood. It’s not a bad idea to check out the numbers on Crime Reports, a site that offers free searches of crime reports by location, but don’t stop there. Talk to people in the neighborhood and check it out for yourself. Air and water quality: Pollution levels can affect everything from asthma and allergies to cancer rates, and air and water quality can vary drastically from place to place. Visit theEnvironmental Protection Agency (EPA) website to search your environment by zip code. You can also use its search functions to find out if there are sources of green power available in the area. Know what house style you prefer, but try to imagine living in it, not just how it looks from the street. 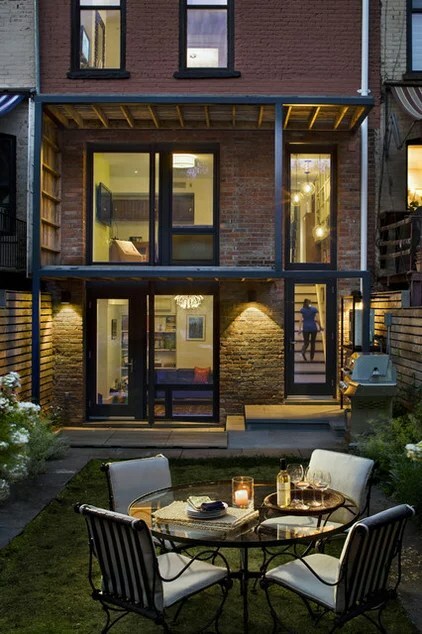 Imagine how you will use each room and pay attention to the flow between indoor and outdoor spaces. Similarly, don’t focus so much on the house itself that you forget to notice the block you would be moving to! Meet the neighbors if you can (bold folks could even knock on doors) and look for well-maintained homes, people out walking and roads and sidewalks in good condition. See what homeowners are paying for improvements around the U.S. The very first question you should ask yourself before purchasing a home is whether you can easily afford it. If it’s a stretch, the pain of keeping up with payments is only likely to build over time. Make life easier on yourself and choose a little less home than you can afford. Be willing to compromise (nowhere is perfect!) but do choose a place that has at least your top three qualities. Tell us: Are you thinking about moving? How did you end up living where you do now? Share your stories in the Comments! This entry was posted in Uncategorized on January 13, 2014 by Tracy Zaik. I live and work in Boulder, Colorado. I'm lucky to call Boulder my home and would love to help you do the same. I specialize in the Newlands Neighborhood and am involved in many Community organiztions. To stay updated, check back often for the latest happenings in Boulder and the real estate market!